Aluminum Treads cover all sizes of stairs/steps. Available as 9 and 11 in. aluminum treads, products cover any size or shape step and come in 8 colors: black, white, grey, brown, green, red, blue, and yellow. Also offered is 4 in. tread with continuous anchor system to use when inserting treads into freshly poured, still soft concrete. Slip-resistant treads meet OSHA, AFA, ISO 9000 standards. Cleveland, Ohio-Don't take chances on your customers' and employees' safety. Bold Step has expanded its aluminum replacement treads line to cover any size or shape step. 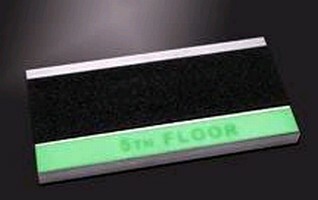 Now available in 9" and 11", Bold Step aluminum treads come in 8 colors, which are sure to catch the eye. Also offered is the 4" tread, which has a continuous anchor system utilized when inserting treads into freshly poured yet still soft concrete. Don't spend outrageous sums to renovate those slippery basement steps leading to restrooms, kitchens and storage areas-make them safer and revitalize them cost - effectively with new Bold Step replacement treads. When customers and employees come in from the elements-sleet, snow, rain-steps in your establishment can be treacherous-but not anymore! Bold Step's new aluminum treads offer peace of mind and a sure step you can trust. The Bold Step grit holds even the most slippery soles in place. 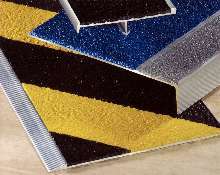 These slip-resistant aluminum replacement treads come in the following colors: black, white, grey, brown, green, red, blue, and yellow. Meets OSHA, AFA, ISO 9000 standards. Contact your local distributor, or call 1-800-522-6566. Visit Sure-Foot on the web at www.surefootcorp.com. Anti-Slip Flooring Solutions withstand traffic, harsh conditions. Stair Tread meets or exceeds ASTM and OSHA standards. Warning Tread suits use on steps and landings. Anti-Slip Treads provide permanent footway solutions. 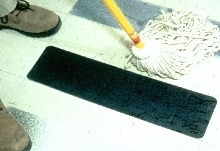 Anti-Slip Tape comes in black, white, and gray. Heated Stair Treads provide sure footing in icy conditions. Anti-Slip Treads make worn-out stairs safe.